Some of the most famous dinosaurs of all came from the Late Cretaceous of North America, famous formations such as the Hell Creek Formation of Montana. Model maker Robert Townsend has put together a substantial prehistoric animal themed diorama that illustrates this time in our Earth’s history. For fans of iconic dinosaurs such as Triceratops, Tyrannosaurus rex and Ankylosaurus there is certainly much to admire in Robert’s four metre long prehistoric scene. A herd of duck-billed dinosaurs down by the river. Robert began his dinosaur model collecting in the 1990’s and over the years he has built up an extensive collection featuring replicas from a number of manufacturers including figures from the “Walking with Dinosaurs” series, that were first made back in 1999. These figures are exceptionally rare and quite collectable. In addition, Robert has augmented his model portfolio by purchasing dinosaur replicas that come from other manufacturers such as the excellent Wild Safari Dinos Pachyrhinosaurus (Safari Ltd), seen in the foreground of the picture below. Over the last decade or so, the choice for discerning collectors like Robert has increased enormously, take for example, the CollectA range “Prehistoric Life”. Since this range was began back in 2005, it has grown to include over 150 different prehistoric animals, fossils of many of which, date from the Upper Cretaceous. A Pachyrhinosaurus (foreground) and a Torosaurus (background). The beautifully detailed CollectA Kosmoceratops dinosaur model was introduced in 2012 and remains one of the favourite CollectA figures with Everything Dinosaur team members. Kosmoceratops fossils have been found in Utah (United States) and although the fossils are from Upper Cretaceous rocks, this horned dinosaur lived earlier than the likes of Triceratops, Ankylosaurus and T. rex. Kosmoceratops roamed some 75 million years ago. The discovery of Kosmoceratops and other Late Cretaceous horned dinosaurs such as Mercuriceratops and Utahceratops has helped scientists to establish several distinct dinosaur faunas on the landmass that formed western North America. This land, called Laramidia covered what was to become Utah and Colorado in the south stretching north up into Alberta, Canada. A Tyrannosaurus battles an Edmontosaurus. It’s not just plant eaters that features in Robert’s detailed diorama. There are plenty of carnivores too. In the picture above a T. rex attacks an Edmontosaurus. Both of these models come from the excellent Wild Safari Dinos range. As you would expect from a prehistoric scene that depicts life at the very end of the Cretaceous, Tyrannosaurus rex features prominently. 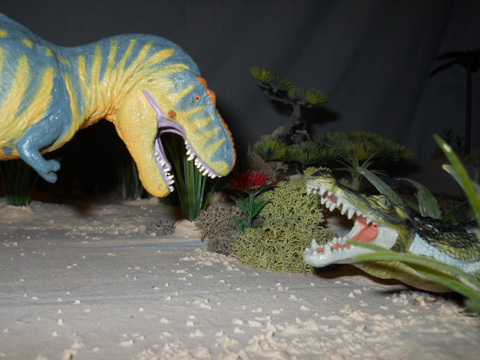 In the picture below, a Battat Terra T. rex (1998 model version), challenges a Deinosuchus (prehistoric crocodile model which is part of the Safari Ltd Carnegie Collectibles series). Sadly, the designer behind the great Battat Terra range, Dan LoRusso passed away last year, but Everything Dinosaur, in honour of this talented palaeoartist have brought the range into the company’s product portfolio, and once again the Battat Terra range is available (whilst stocks last). An Ankylosaurus mother and young.